Apollo 37zz free download. Forget all the other audio players ! If you care about sound quality rather than looks, then this is the ultimate player ;) Apollo is perhaps best recognized by its playlist oriented interface. Forget all the other audio players ! If you care about sound quality rather than looks, then this is the ultimate player ;) Apollo is perhaps best recognized by its playlist oriented interface. Apollo is perhaps best recognized by its playlist oriented interface. Playlists can be modified or created with standard Windows methods lie drag'n'drop and context menus. The main playlist will be shown as a tree, which may contain nested playlists. This makes it possible to have multiple playlist files open at once, yet having the possibility to handle them as separate entities. 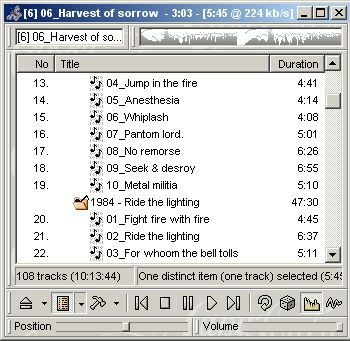 The playlist system will retrieve ID3 and ID3v2 tag information for not only MP3 files but for all supported formats. Based on the tag information � along with common track properties � it is possible to create random entries into playlists. This means that instead of inserting a track into your playlist, you can insert an entry which sets conditions for the track to be played. When the player encounters such an entry while playing the playlist, it picks the track to be played randomly according to the conditions. These so called advanced playlists along with the continuous playback and crossfading make Apollo a considerable choice for some more demanding tasks. There are, for instance, some dance clubs and radio stations that are based on Apollo.